Leaving Jakarta for the Tanjung Puting National Park was an adventure. Jakarta is a big, big city with major traffic problems. And all I knew about Central Kalimantan, where we were headed, was that it’s sort of a backwoods area. Quick geography note: Jakarta, which is Indonesia’s capital city, is on the island of Java. The Tanjung Puting National Park, and the towns of Pangkalan Bun and Kumai are in the province of Central Kalimantan, which is one of several Indonesian provinces on the island of Borneo. Borneo, the third-largest island in the world behind Australia and Greenland, is shared between Indonesia, Brunei, and Malaysia. Sunday night I asked the manager of our B&B if we could use their driver to take us to the airport Monday morning. Our flight was scheduled to leave at 9:15. The manager said we should probably plan to arrive about 8:00, and since it can take 90 minutes to get there in rush hour, we should leave by 6:30. So I set an alarm for 5:00, to give us plenty of time to finish packing, have some breakfast, and so on. At about 5:10, while I’m stepping out of the shower, there’s a knock at the door. It’s the driver. He has arrived early and wants to leave soon to avoid traffic. As much as Indonesian airlines have a reputation for being late, everyone else we’ve dealt with is actually ahead of schedule. We tell him we need to finish packing — by which we really mean “start and finish packing”. I towel off while Beth frantically packs her stuff into her bags. I do the same. We split a banana for breakfast, and bolt off to the airport with the driver. I’ll learn later that rushing to leave made me accidentally leave a few things behind — the receipt for the airline tickets which must have fallen off the nightstand out of sight (oops), the coconut juice I just bought the day before so I’d have a nice drink, the little bottle of hot sauce I intended to take with me on the rest of my travel since I neglected to pack some Cholula back in Denver, and Beth’s super expensive instant decaf coffee, which is the only decaf instant coffee I ever saw in three different supermarkets and several convenience stores. Traffic was light (for Jakarta), and we arrived at the airport about at about 6:45. I paid the driver the B&B’s standard rate for doing airport transfers, which is two or three times as much as a taxi, but still cheap by American standards. There are only two flights each day that go from Jakarta to Pangkalan Bun, where we were headed. And they’re two different airlines. We chose the morning flight, which of course was with the airline with the worst safety record in the region, Trigana Air. Google the name and instead of complaints about the small seats or bad service, as you’ll see for any American budget airline like Frontier, you’ll see news stories about all the various things their aircraft have run into in the air or on the ground. Animals, houses, trees, the ocean, etc. Often there are survivors, sometimes not. Anyhow, we booked the earlier flight in case that flight got canceled or delayed until the next day. That would give us an option to possibly buy tickets on the spur of the moment for the afternoon flight on the other airline. The check-in process was a little weird. We didn’t know what to do, and the signs with the details aren’t in English. But we eventually figured it out through trial and error. We stood in line at a Trigana counter outside the airport, where I showed the guy our e-ticket on my phone. He then printed it out, dated it, and initialed it. Then we took that paper and our bags to go stand in a line to get into the airport. After showing a security agent the paper the guy had initialed, we were allowed to go through the first security screening. Our bags went on the conveyor and we went through a metal detector. As usual, I set it off, and the guy with the electronic wand came over and gave me a cursory once-over, realizing that my cell phone probably was the culprit. Then he apologized and let me go on my way. We then stood in a third line, where we checked in our bags, showed our passports and the special initialed paper, and got our boarding passes. On Trigana, checked bags have a weight limit of 20 kg, unlike the 22 kg from every other airline we’ve flown so far. My suitcase had been right at 22 on the flight from LA to Sydney a month ago. Would my efforts to get rid of stuff pay off? Yes! The giant bag came in just under the limit, at 19.9 kg. We then went to a food court to find our second breakfast. I found a place with coffee drinks, but they allowed smoking, which in Indonesia essentially means that smoking is mandatory. So I got my coffee to go and met up with Beth in the main food court area, where we ordered some fried chicken. She got a whole meal (“PAKET 7” I think it was called) that included a chicken breast cutlet a lot like chicken katsu, some cole slaw, some chicken egg drop soup that I really liked, rice, and iced sweet tea. I got an order of chicken strips which were pretty tasty. Beth finished off her meal with some chocolate mousse mochi. We eventually found our way to the right departure lounge and waited. The flight left late, which surprised nobody. There was a cheer when the boarding call was finally made. About half this flight was tourists like us, people who were going to Pangkalan Bun in order to visit Tanjung Puting. There was a huge group of Scandinavians with very nice camera gear. Beth found out it was a photography class. And we would see these Scandinavians with their huge cameras on and off for the next several days. On the flight I sat next to a young woman from London who seemed to be a solo backpacker. 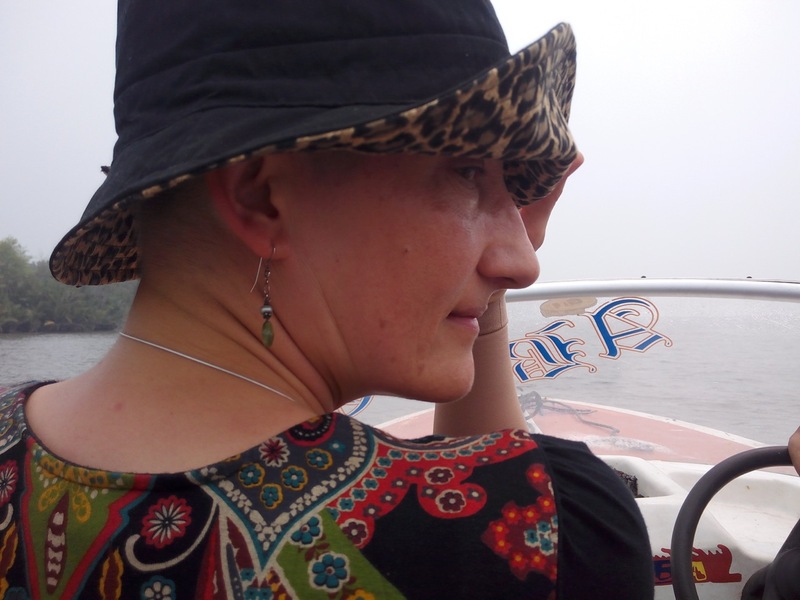 She was also headed for Tanjung Puting, but had only been in Jakarta two nights and one day. She said both nights combined she only got about three and a half hours of sleep. She fell asleep before snacks were served, so I saved her a snack box for when she eventually woke up. Snacks were a little cup of water, a tiny dim sum type thing with meat inside, and a piece of banana bread. Oh, and the airplane was quite roomy, actually. The seat pitch was far beyond what I’ve seen in any 737 operated by a US airline, even in the “economy plus” type seats. There was at least a six inch gap between my knees and the seat in front of me. Unfortunately, the seats were also sized for Asians and the top of the headrest came up to right between my shoulder blades. So I couldn’t tilt my head back and snooze. About 45 minutes into the 65 minute flight, the captain came on the intercom to tell us that visibility at the airport had just dropped below the minimum 2000 meters. If it remained too low, we would have to turn back around and return to Jakarta. The reason for this is that the airport doesn’t support instrument landings. So if you can’t see the end of the runway, you can’t land. And it was really smoky, as it has been for weeks, due to the forest fires. However, the pilot pressed on and we did land. I was watching out the window and didn’t even see the ground through the haze until about 30 seconds before we touched down. Once we landed and got out of the plane, I looked back and couldn’t see the end of the runway through the smoke, so I’m pretty sure visibility wasn’t good enough. But we landed anyway. I wondered for a second if there’s a fine for landing when you’re not really supposed to land. 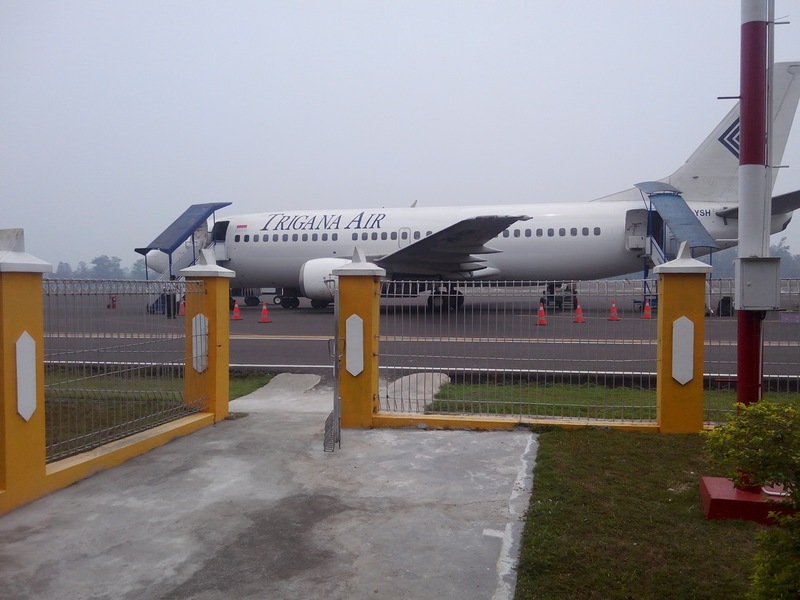 Iskandar Airport at Pangkalan Bun is actually a military airport. 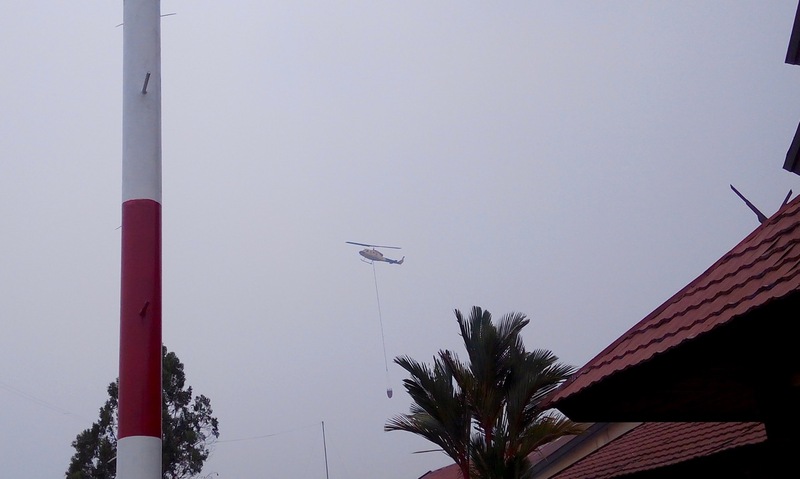 Here you can see a helicopter involved in firefighting operations. The tiny airport was swamped by tourist and a few locals, all waiting for our bags. Even though our two suitcases went on side by side, one arrived at the baggage carousel about 30 minutes after the first. I don’t know why. We got our bags, showed the baggage agent our claim tickets, and then went outside. I was looking for someone with a piece of paper with my name on it, which we’d been told to do. But nothing. Beth watched the bags while I wandered all around the front area of the airport. Still nothing. Just as I was getting out my cell phone to call our tour guide, a guy came up to me and asked if I’m Todd Bradley. Connection made! Having read about airport taxi scams, I decided to quiz him about the name of our mutual friend (the tour guide) since he hadn’t been holding my name as the guide said he would be. He gave the right answer. Over the next half hour, that first guy transferred us into a taxi which then drove us through an army base, down some dirt roads, and eventually to the port of Kumai. A small army of helpers descended on us and carried our bags and led us through some alleys down to some boats in the river. 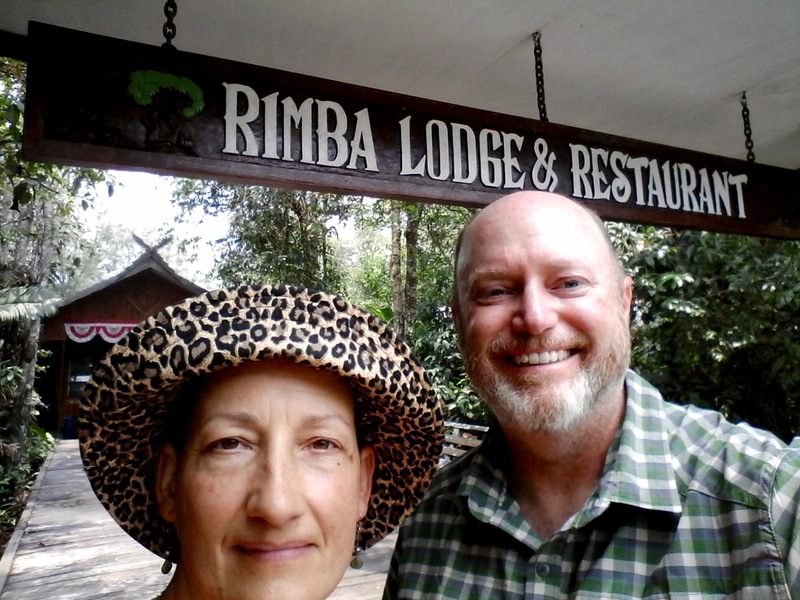 We climbed through several boats and eventually got into the speedboat that was to take us to the Rimba Ecolodge upriver where we were scheduled to stay the night. When I had heard we would transfer in a speedboat, I had visions of something like a waterskiing boat in the US. Instead, this boat was about the size of a jacuzzi, with two wooden benches. We stuffed four people, two suitcases, and two backpacks into it, and took off. The guy driving seemed to be new to this because the other guy sat behind him pointing and giving him instructions. Beth sat in front next to the driver, and I sat in back next to the guy who seemed to know what he was doing. On the noisy high speed cruise up the river, we did stop or slow a few times. We saw our first orangutan in the wild. It was hard to see, just the outline of a creature climbing up some trees about 10 m from us. We also saw a very large crocodile, answering Beth’s unasked question about whether it’s safe to swim in the river. There weren’t many birds. I don’t know if that’s because they were scared off from the noise of the speedboat, or if they just don’t hang out near the river in mid day. We finally ordered from the very extensive menu, and enjoyed a cold Coca-Cola. We were the only people in the restaurant, and since it wasn’t air conditioned, I wanted to sit under a fan, so we switched tables. While we ate, we spotted the neighborhood monkeys climbing around on the trees outside the restaurant pavilion. And then I suddenly understood why they keep the doors to the restaurant closed all the time. This is the most adventurous blog I’ve read so far, and obviously the stars were all aligned such that you made it without a hitch. As I read it, I could visualize it as a movie full of suspense and action like Raiders of the Lost Ark. Well, we were a bit late, but other than that, you’re right — not a hitch. Getting back off the island of Borneo was a much more difficult challenge.